Think of all the things you like that are made with cherries. You have pie, and cherry ice cream, plus eating a bowl of plain cherries is a treat! Cherries are one of my favorite things to eat – ever. But that pit makes them a little less enjoyable – and where exactly should you put that pit when you are enjoying a bowl of cherries anyway? Well, if you are eating alone, you can just put the pit back in the bowl. But, if you are sharing a bowl – you may not want to do that! If you don’t want to have to buy or use a cherry pitter, there is a simple and easy way to get the pit out! All you need is an empty bottle and some chopsticks! 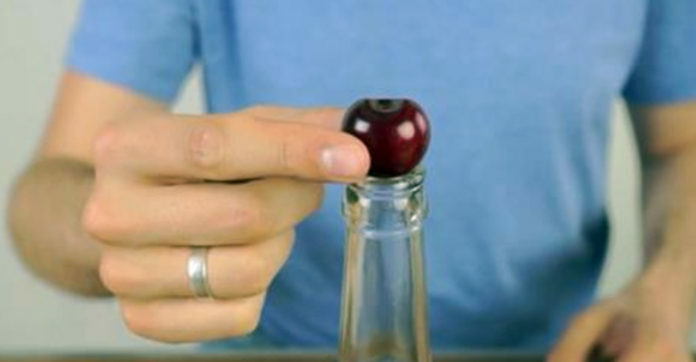 This will make cooking or baking with cherries a lot simpler too!